A stroll along the peaceful white sand beach of Sanur could take a half hour or an hour, depending how many times one stops to look into local gardens of both hotels and private properties. This Bali hotel is on the eastern side of Bali, and the town of Sanur, the 'original tourist resort of Bali' is enjoying a lot of new attention as a visitor 'hot spot'. Sanur Beach, as well as the town, are safe for families with small children. 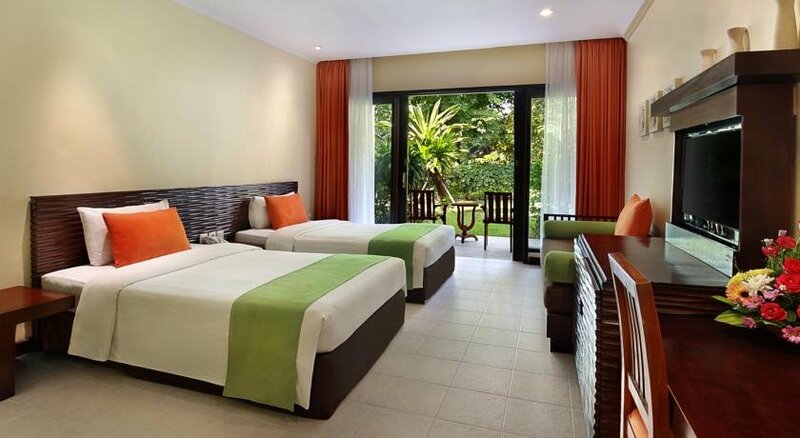 The Mercure Resort Sanur Hotel is located at Jalan Mertasari on the outskirts in Sanur. There are 189 rooms offered in a variety of styles and sizes. All are fitted with satellite TV, high speed Internet, luxury linens and many other amenities. Because it is right on the beach, the hotel provides direct access to the warm sea waters, where paddling by the very young is perfectly safe because the waves are broken on the way in by the local reef. The Resort also provides many other activities, facilities and services. Also in the grounds is a Yoga Centre, and right next door a Surf Paddling School. There are many restaurants within strolling distance.